6 Week Guitar. The Free Beginner Guitar Course. Your Step By Step Route Map To Guitar Playing Success. Hi, Andy here and Welcome to the 6 Week Guitar course! This is Volume 1 in my new 5 Volume series that will take you on a fun and fulfilling musical journey, from complete beginner to a capable and confident guitarist. AND, you can access Volume 1 right now by clicking the “Get Access Now” button below. 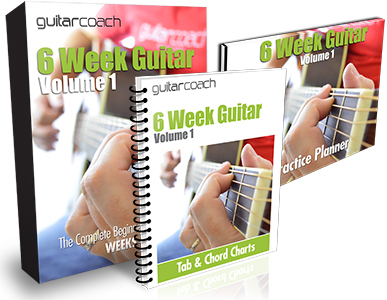 It’s 100% FREE and I guarantee that you will have an excellent time while learning the guitar! Each of the 6 Week Guitar courses have been designed as a complete and comprehensive structured system, to provide you with a clear pathway to achieving your guitar goals easier and faster than ever. With each volume you’ll be learning more essential guitar skills and techniques, while also building your own collection of songs that you can play for friends and family, or simply for yourself. Either way, you’ll notice amazing improvement with each passing day when you follow this new guitar course. Now, as we all know, becoming an accomplished guitarist is not an easy thing to do, and it certainly doesn’t happen overnight. But with this highly effective system and route map, we’ll make it as easy, fun, and informative as possible. Just click the button below and you will be taken directly to the registration page where you can enter your details and get started immediately. And one last thing, if you enjoy this guitar course, then I sure hope you’ll share a link to this page on Facebook, Twitter or other social media channels. Thank you so much and let’s get going with learning to play the guitar!